Originating on the islands of Ibiza and Formentera, this cheesecake is called Flaó and is thought to have been created during the reign of King Jaume I. It is a very popular cheesecake and many tourists who visit the islands return to their homes carrying one. The cheesecake is a unique combination of flavors — anise and mint. The crust, which is peppered with anise seeds and kept moist with anise liqueur is pressed into a tart pan or springform pan. 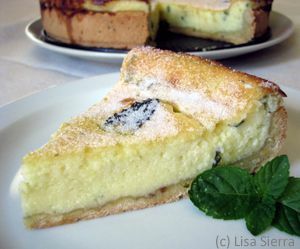 The filling is made from fresh cheese (or ricotta and mascarpone), eggs and chopped mint. Once baked, the top is sprinkled liberally with granulated sugar. Note: while there are multiple steps to this recipe, this Spanish dessert is broken down into workable categories to help you better plan for preparation and baking. Heat oven to 360 F/180 C.
Put sugar and shortening into a medium size mixing bowl and beat with an electric mixer. Beat egg in a separate bowl, then add to the sugar-shortening mixture and beat well. Add oil, lemon zest, salt, anise seeds and liqueur and mix well. Gradually add 1 cup flour while mixing with a large spoon until entire cup is mixed in. If ​the dough is too moist or runny, continue adding flour a bit at a time until the dough is a soft consistency. Form dough into a ball, and place it on parchment or waxed paper. Roll out dough until it is approximately 9 1/2 to 10 inches in diameter. Grease the pan with vegetable shortening and press dough into it. Use an 8 1/2-inch (22 cm) fluted French tart pan, or springform pan of the same size. Beat the eggs and sugar together in a medium-size mixing bowl. Add cheese and beat until smooth. Finely chop the mint leaves and stir into filling. (Do not beat mint leaves with an electric mixer, or filling may turn green.) Place whole mint leaves around the outside for decoration. Pour filling into crust and bake in center rack of oven for 45 to 60 minutes. Cheese should ​turn a golden color. Remove and sprinkle top with a coating of granulated sugar. Cool on counter, then refrigerate until ready to serve.